My friends and I were wanting to try these famous burgers for so long, it finally happened. After taking the LA Metro (now I understand the L.A. traffic + Uber lifestyle) and miles of walking, we finally see the neon sign. Rewind, we were on vacation so we decided to be all touristy and sh**. We took the subway. No. No. No. I now understand why everyone says that Los Angeles public transportation is terrible. Of course, we were confused and got off too early and ended up walking about 6 miles. Was IN N OUT worth my swollen ankles? Typical high-volume fast food restaurant type of feel. Although, the drive-thru line was bananas and wrapped around the joint. There was so many people that they had waiters outside taking car orders, like it was Sonic. I couldn't believe it. It was definitely the place to be at 12 AM. Packed with families, friend groups and everyone in between, getting a seat here is survival of the fittest. We had all eyes peeled on every table just waiting until someone made a move, then we slid right in. Considering how busy this IN N OUT was their service was rather quick. We stood in line for about 5 mins and only waited 10 mins for our food. Although on our second visit, the food didn't taste as good. Maybe it's not good back to back? (haha, Drake) Some guy was causing a scene about his order being wrong, pretty funny. IN N OUT provides entertainment too, obviously. Pretty damn good. The burgers were juicy and the buns were perfectly soft. I ordered both my burger and fries 'animal style', which is technically from the No-So-Secret-Secret Menu. 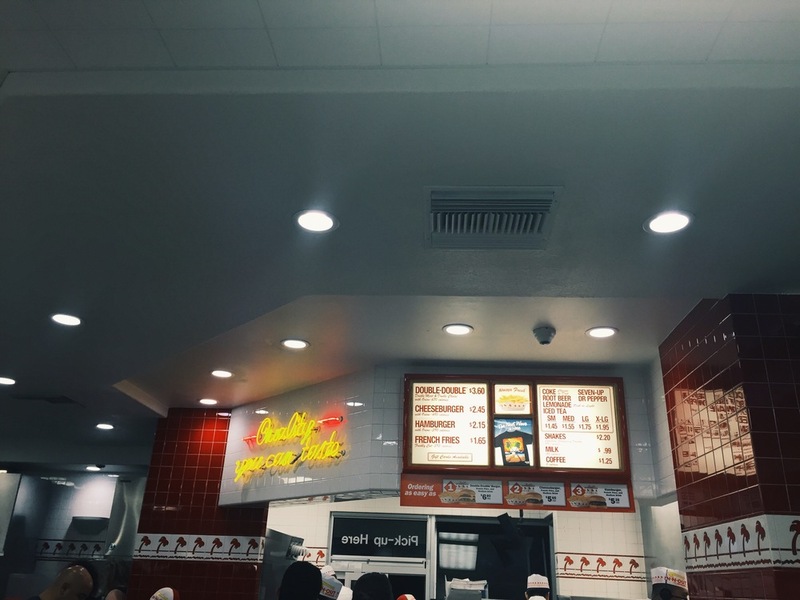 Animal style is when grilled onions are added. OMG. Between the sauce and onions, I don't know which made the burger. The fries are hand-cut potato fries and they definitely taste like it. Very fresh. Okay you're drooling now, aren't you? P.S. Kinda on a West Coast high rn after seeing Straight Outta Compton. Ahhh go see it ASAP!